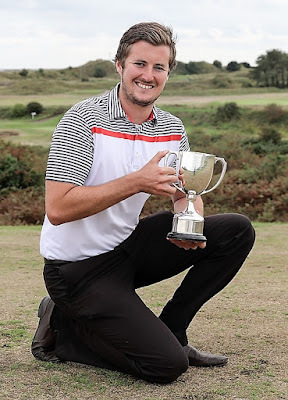 Cardiff golf pro Toby Hunt ensured there would be repeat of last year’s final round stumble in winning the Welsh National PGA Championship at Ashburnham. But it was a close run thing for Hunt, a PGA Professional who represents St Mellons Golf Club. Having led at the halfway stage at Celtic Manor in 2017 when Sion Bebb went on to win the tournament for the third time, another previous winner came close to foiling his victory bid 12 months later. This time Garry Houston, who won the title in 2015, threatened to poop Hunt’s party and claim the £1,500 first prize. As did Rhys Enoch, courtesy of a spirited late rally. In a tense denouement to the Asbri Golf sponsored event, both finished a stroke adrift of Hunt on seven-under-par after trailing him by three shots at the mid-point of the second and final round. Hunt and Enoch had begun the day four and three shots respectively ahead of Houston. And although Enoch struggled to find the form that had seen him play all four rounds in last month's Open Championship, there was little hint Hunt would be caught. That is until he double-bogeyed the par three 16th and joined Houston on eight-under. Parity was brief, however. As Hunt approached the 17th tee, up ahead on the green Houston missed a short putt and his one shot advantage was restored. Hunt had recovered from wobbles earlier in the round, not least when he steadied the ship with a par after a double bogey at the par-five fifth and then posted three successive birdies. Reflecting on his response to setbacks, he explained: “Tiger Woods has been my hero since I was able to walk. If he makes a bogey, he makes a birdie straight afterwards. It’s something he’s always been able to do. The double bogey with two holes remaining presented a different scenario, however, and Hunt added: “I was running out of holes so my chances of making amends were limited." In the event, successive pars sealed victory although Enoch did his best to force a play-off with a bold attempt to drive the par-four 18th that ended with him signing off with a birdie as opposed to the eagle he needed. Helping Hunt hold his nerve and regain his composure was Barry Thomas, the head PGA Professional at St Melllons who was on the bag. While Hunt won the major event, the competition for senior Welsh PGA Professionals was claimed by the host club’s Martin Stimson after two negotiations of familiar territory with a one-under-par score of 143.